The ollie is a skateboarding trick where the rider and board leap into the air without the use of the rider's hands. It is the combination of "popping" your foot on the tailbone, and sliding your other foot up the board, and jumping with the board within a matter of seconds. It is one of the first tricks a skateboarder must learn before moving on to more advanced tricks. The ollie originated in vertical skateboarding, and later on flat ground. The ollie is a fundamental skill in skateboarding and is used to leap onto, over, or off obstacles, or over gaps of unfriendly terrain such as grass or stairs. As so many tricks depend on it - for example the kickflip and heelflip - the ollie is often the first skill to be learned by a new skateboarder. The ollie typically takes considerable practice to learn. Many skateboarders will learn the ollie within the first year of beginning to learn how to. In 1978, Alan Gelfand, who was given his nickname "Ollie" by Scott Goodman, learned to perform no-handed aerials in bowls and pools using a gentle raising of the nose and scooping motion to keep the board with the feet. There are numerous references to Alan Gelfand's Ollie with most notably pictures in the 1970s skateboarding magazine "Skateboarder". In 1982, while competing in the Rusty Harris contest in Whittier, California, Rodney Mullen debuted an ollie on flat ground, which he had adapted from Gelfand's vertical version by combining the motions of some of his existing tricks. Mullen used a "see-saw" motion, striking the tail of the board on the ground to lift the nose, and using the front foot to level the board in mid-air. While Mullen was not initially impressed with his flat ground ollie, and did not formally name it, he realized it opened up a second, elevated plane on which to perform tricks. Mullen's flat ground ollie is now considered to have transformed the practice of skateboarding. Rodney won the Rusty Harris contest, was afterwards asked by many riders to demonstrate the trick, and later in the year it would appear with the name "Ollie-pop" as a "trick tip" in the skateboarding magazine Thrasher. The flat ground ollie technique is strongly associated with street skateboarding; mini ramp and vert riders can also use this technique to gain air and horizontal distance from the coping, but half-pipe riders typically rely more on the board's upward momentum to keep it with the rider, more similar to Gelfand's original technique. 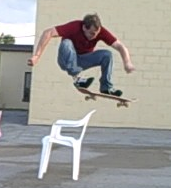 Nick Capamaggio performing an Ollie over a chair. The rider begins the ollie by crouching and jumping directly upward. As the rider begins to leap, instead of lifting the feet from the board, they "pop" the tail by striking it against the ground, which raises the board nose-first. Maintaining contact with the board, the rider lifts the front leg and bends the front ankle so that the outer or top side of the shoe slides towards the nose of the board. The friction between the shoe and the board's grip tape (which not all skateboarders will choose to have, although most do) helps to guide and pull the board upward, while the rear foot only maintains slight contact with board to help guide it. When nearing the peak of the jump, the rider lifts the rear leg and pushes the front foot forward, which levels the board and keeps it in contact with the back foot. The skater can gain greater clearance from the ground by jumping higher, popping faster, sliding the front foot farther forwards (starting the jump with the front foot farther back), and pulling the legs higher into the chest to raise the feet higher. Skaters attempting record-setting ollies even contort the legs so that board and feet are not directly below them, allowing the board to rise at or just below the level of the pelvis. Very low ollies can be achieved using the same technique, but without the tail making contact with the ground. Even basic flip tricks can be achieved without the "pop" of the tail. An example of a very low ollie. Ollie technique. Alameda Central, Mexico City, 2015. A skateboarder performing an ollie over a gap. The highest official flat ground ollies are generally performed in ollie contests. The highest preferred stance ollie was 45.00 inches (114.3 cm) from the ground, performed by Aldrin Garcia. The highest switch stance ollie was 40.125 inches (101.92 cm), performed by Gavin Caperton. The world record for the greatest number of consecutive ollies is held by Rob Dyrdek, who performed 215 ollies on the television show Rob and Big. The most common variation of the ollie is the nollie (short for "nose ollie"), where the rider reverses the roles of the two legs so that the front foot pops the nose to the ground, and the rear foot lifts and guides the tail. The switch stance ollie uses a similar body motion, but the nollie is subtly distinct: For one, the rider is always moving forward, with the body positioned in a nollie stance--closer to the nose and with the front foot on the nose. Secondly the rider usually postures the body differently so as to compensate for this stance with respect to the forward motion. The rider presses the nose down using their front foot to engage the "pop" motion in order for the board to rise. This is In contrast to a "Fakie Ollie" where the pop motion is performed by the rear foot on the tail, similarly to a normal Ollie, however the rider is traveling backwards when performing a Fakie Ollie. Where in a Nollie the rider is traveling forward with their front foot on the nose to apply the initial force "pop". Switch Ollie: an Ollie performed in the stance opposite of a rider's normal stance. (Switch Stance). Nollie: an Ollie performed using the front foot to snap the nose down. The Chinese Ollie: executed without hitting the tail of the skateboard to the ground, instead the skateboarder uses cracks in the sidewalk, by "bouncing" off them, to get air-time. Nollie 180: just like the Ollie 180 but done from a Nollie. Half-Cab: just like the Ollie 180 but done in fakie. If rotated 360 degrees the trick is called a Full-Cab or Caballerial, named after Steve Caballero who invented them as aerials in pools. Cab and half-cab spins only include fakie backside. A fakie frontside 180 is not a half-cab. Switch Ollie 180: just like the Ollie 180 but done from a Switch Ollie. Ollie 360: is a full 360 rotation of the body and board together in one motion, whether front-side or back-side can be attained from this variation. One Foot: an Ollie where the front foot is kicked forward over the nose of the board. Ollie North: Another name for the ollie one foot. Boned Ollie: an ollie where the board is dipped down and the legs are practically horizontal, like a "Melon Grab" but without the skateboarder actually grabbing the skateboard. Ghost Ollie: an ollie where the skateboarder's feet are above the board but the board and the skateboarder are still in air. Pop-Shuvit: is an Ollie variation with the snap of the tail rotating the board 180 or 360 beneath the rider and catching it in mid-air. A Pressure-flip has a similar aspect from this trick, but only by applying pressure back-toe inward while jumping, will the rider make a rotation and inward flip successful. primo Ollie: is an Ollie performed when standing in a primo position or when doing a primo slide. A primo Ollie is executed in the same way as an Ollie but the side of the front foot levels out the board instead of the top of the foot. ^ "Maloof High Ollie Finals. Posted: February 16, 2011". ^ http://www.proskateboards.co.uk/5/articles/18/ollie-skateboarding-trick/ The world record for the highest number of consecutive ollies is held by Rob Dyrdek, who performed 215 ollies on the television show Rob and Big.